Critique en français à suivre. Last night I finally got to see Théâtre Français de Toronto’s production of The Precious Young Ladies at The Berkeley Street Theatre, something I had been looking forward to all week. I have always been very impressed with their work so I was more than excited to see their latest Molière adaptation. 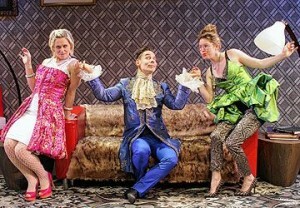 The Precious Young Ladies is a one-act comedy by Molière in prose that takes a satirical aim at the extravagant and delicate ladies of the French bourgeoisie. Magdelon and Cathos are two cousins from the country who have come to Paris in search of love and adventure. When they reject and ridicule two eligible suitors, the men vow to take revenge on les précieuses by tricking them into falling in love with their valets–who are disguised as sophisticated men of the world. 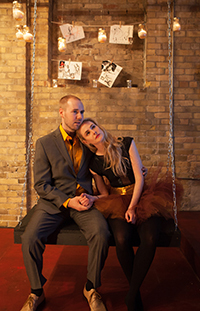 Wednesday night was my second experience with Sterling Studio Theatre. I enjoyed their production of Specter so much that I was really looking forward to seeing their preview performance of Lanford Wilson’s play Burn This. An interesting space, I wondered what they would do with it this time. Burn This begins shortly after the funeral of Robby, a gay dancer who drowned in a boating accident with his boyfriend. Set in a Manhattan loft shared by Robby’s roommates Anna; his dance partner and choreographer, and Larry; who works in advertising, Burn This is about reconsidering identity and relationships. Pale, Robby’s older brother, forces everyone to make sense of their lives when he bursts on the scene. On a snowy Tuesday evening I made my way to catch a performance of Humber River Shakespeare‘s A Christmas Carol. Having never actually been to Casa Loma in all my years living in Toronto, I was pretty excited to finally see it. 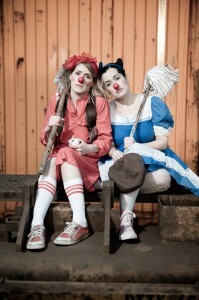 Co-produced by the Théâtre français de Toronto and Théâtre La Catapulte, le fa le do is unique, hilarious, and full of suspense / Co-produit par le Théâtre français de Toronto et Théâtre La Catapulte, le fa le do est à la fois unique, hilarant et plein de suspense. 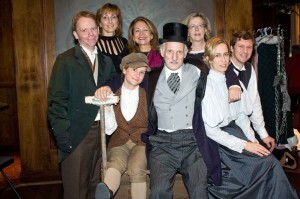 After seeing TfT‘s production of Les Fourberies de Scapin, I was eager to see more. Unlike a Molière play, I had no idea what to expect with le fa le do. 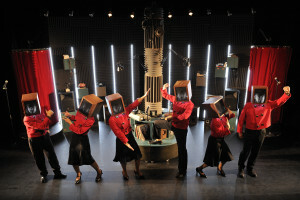 A unique co-production of Théâtre La Catapulte and Théâtre français de Toronto, le fa le do is both hilarious and suspenseful. First off, let me admit that I am a huge fan of Neil LaBute. 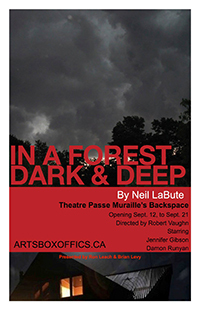 I have read, seen and even been involved in several of his plays over the years, which was why I was excited to catch his latest play In A Forest Dark & Deep in the Theatre Passe Muraille Backspace. In A Forest Dark & Deep tells the story of brother and sister Bobby and Betty reuniting in a cabin in the woods. Bobby thinks he’s simply lending his sister a hand with clearing out her cottage for new tenants. But it’s a dark and stormy night, and his sister has a big secret. For my last show of the evening, I went to the Tarragon Solo Room to catch a performance of Adopt This! written and performed by Dan Bingham. Expecting to see his usual style of comedy (which is hilarious), I was pleasantly surprised by the level of honesty and rawness in this production. Adopt This! is a hilarious and reflective look at growing up adopted. Raised by a strict Irish Catholic mother, Dan Bingham recounts his troubled youth as he recalls the painful abuse of his mother’s boyfriend and his reunion with his rowdy biological Scottish family. 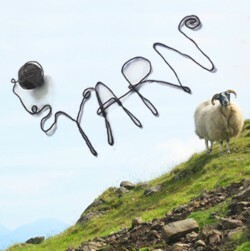 Yesterday evening I saw the opening performance of Yarn by Acky-Made at Majlis Multidisciplinary Arts. This was, first off, one of the coolest venues I’ve ever been to. It’s one of the the site-specifc venues in the Fringe Festival. Everything is outdoors with cute little cushions on your seats. There were candles and rope lights everywhere with tons of greenery and the smell of citronella was in the air. It was the perfect setting for a summer night at the theatre. For my last show of the evening, I went to see The Taliban Don’t Like My Knickers by DYS(THE)LEXI at the Tarragon Extra Space. A multimedia experience, The Taliban Don’t Like My Knickers is a stylized two-hander inspired by the novel ‘In The Hands of the Taliban’ written by British journalist Yvonne Ridley after she was captured by the Taliban in 2001. With Taliban video footage playing constantly in the background, I was expecting something extremely exciting and uncomfortable to watch.